Welcome to Outback Taxidermy, and thank you for taking the time to stop in and check out the services we have to offer. Since you made it here and are reading this, it tells us you are looking for more than what the average taxidermist has to offer. If you are interested in quality workmanship in your trophies that will make you proud to display it like a prized piece of art in your home, office or trophy room you have came to the right place. We understand that pricing is important in anything you do, from purchasing a gun, deer lease fees, traveling out of the country for exotic hunts and many other expenses that go along with hunting and harvesting your trophies, not to mention the long hours you put into hunts, so we keep our prices as competitive as possible without jeopardizing quality of materials used and the workmanship that goes into each trophy we handle. 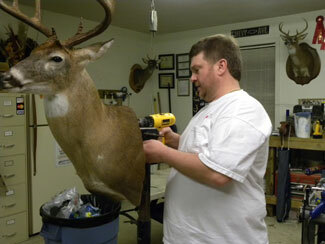 Here at Outback Taxidermy we specialize in mammal taxidermy. We can provide you with trophy tags for your African safaris or your trip down under to Australia as well as New Zealand. If you need your Mule Deer, Pronghorn, Elk or your out of state Whitetail and Bear shipped back, just contact us before your trip and we can make arrangements with a trusted local taxidermist where you will be, to prep and ship your antlers, skulls and capes. We can help with expediting your foreign shipments back into the United States and getting your skins to the tannery. We can crate and ship your mounted trophies straight to your door once they are complete. So no matter your location we can accommodate your mammal taxidermy needs. In closing we would like to thank you for visiting Outback Taxidermy and seeing what we have to offer the everyday local hunters to the world traveling hunters. Please feel free to contact us if you have any questions on getting your trophies back home, no matter the location of the hunt. We look forward to having the opportunity to “Preserve Your Memories Of A Lifetime”.